As a disability scholar, Juarez examines “the intersection of physical and mental human limitation and social exclusion.” She is currently working on a book called Disabled Bodies in Early Modern Spanish Literature: Prostitutes, Aging Women, and Saints. “The purpose is to examine the concepts and role of women in Spanish discourses and texts from the end of the 15th to the 17th century,” she says. “My approach assumes that traditional notions and segregation of female bodies, considered imperfect and inferior in opposition to the norm of the corporeal male, constitute the paradigm of disability in the period. As member of two Modern Language Association committees on disability studies, Juárez-Almendros has promoted this approach in both pre-industrial literature and Hispanic criticism, creating panels, suggesting new members for the committees and mentoring younger scholars in the field. 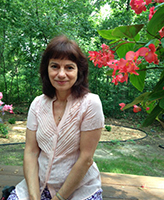 She has also been involved in the Disability Studies Forum at the University of Notre Dame. In addition, Juarez recently edited, coordinated, and wrote an introduction to a forthcoming cluster of articles entitled Disability Studies in the Hispanic World for the Arizona Journal of Hispanic Cultural Studies. In her teaching, Juárez-Almendros delves deeply into the writings of Francisco de Quevedo and Miguel de Cervantes, who, along with the poet Luis de Góngora, are considered the canonical triad in Spanish classical literature. But Juárez-Almendros also brings attention to several female writers—Teresa de Cartagena, Teresa de Avila, Catalina de Erauso, María de Zayas and Ana Caro—to offer another view of early modern literature and life. Juarez says she appreciates the quality and seriousness of the students she encounters in Notre Dame’s College of Arts and Letters—both undergraduate and graduate. Originally published by Aaron Smith at al.nd.edu on September 14, 2013.